Of all the stuff we throw away in Minnesota almost 18 percent is food. Wasted food represents wasted demand for water, land, and fuel. A more concrete way of thinking about this, however, is money: A family of four can save more than $30 a week by making changes in how they shop, prepare, and store food. What would you do with $30 a week? 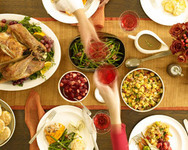 Whatever your answer, here is the how-to, with extra tips for holiday parties and meal planning. Most importantly, make a commitment--right now--to try one of these techniques in the kitchen this year. Which one will it be? 1. Make a list with meals in mind. Create a shopping list based on specific meals. Choose recipes based on what you already have at home. Try out this Meals in Mind shopping list template from the Food: Too Good to Waste toolkit. 2. Get help with portion planning. The fear of not providing enough to eat often causes hosts to cook too much. A handy tool for party planning is the “Perfect portions” planner from Love Food Hate Waste, a U.K. nonprofit that focuses on sharing convenient food reduction and reuse tips. 3. Keep fruits and vegetables fresh by prepping ingredients for the week as soon as you get back from the store. Use both this fridge-friendly smart storage guide and A-Z storage guide from Eureka Recycling to extend the life of produce. 4. Use small plates and utensils. Simple tricks of using smaller serving utensils or plates can encourage smaller portions, reducing the amount left on plates. It is much easier and more hygienic to use leftovers from serving platters than from individuals’ plates. 5. Allow guests to serve themselves, choosing what and how much they would like to eat. This also reduces the amount of unwanted food left on plates. 6. Refrigerate leftovers promptly. The U.S. Department of Agriculture recommends that hot foods be refrigerated within two hours after cooking. Store leftovers in smaller, individually sized containers, making them more convenient to grab for a quick meal. 7. 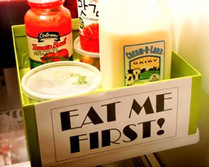 Designate foods to eat first. Download and print this Eat First sign so that everyone knows and remembers. 8. Create new meals. Check out Love Food Hate Waste’s creative recipes for using your food scraps to create new meals. Boil vegetable scraps and turkey carcasses for stock and soups, and use bread crusts and ends to make tasty homemade croutons. 9. Compost food scraps. If you have access to a yard, you can start composting in your backyard (even in the winter!). Apartment and condo residents can consider composting indoors using red worms. Better yet, some Minnesota communities offer curbside pick up or drop sites for food waste--see the list of communities here. If you see your area listed, contact your city, county or garbage hauler to see what’s available. 10. Donate extras. Food banks and shelters welcome donations of canned and dried foods, especially during the holiday season and colder months. For a list of Twin Cities programs, visit Rethink Recycling's page on food recovery. Simplify the Holidays, a set of resources from the Center for a New American Dream, is a great first stop for anyone interested in reducing the stuff and stress associated with the holiday season. Brainstorm other no-waste gift ideas by reading through the list from the MPCA.